Abstract: Postoperative cognitive dysfunction (POCD) is a complication that has a reported incidence of 7% to 71% at 7-8 postoperative days, and 6% to 56% at 42-84 days  in elderly patients and predisposes adverse outcomes. Recently, dexmedetomidine, a highly selective alpha-adrenergic receptor agonist, has been shown to suppress the inflammatory response perioperatively and prevent cortical apoptosis. Evidence has demonstrated that the use of intravenous dexmedetomidine has decreased the incidence of postoperative cognitive dysfunction and improved outcomes following surgery in geriatrics. 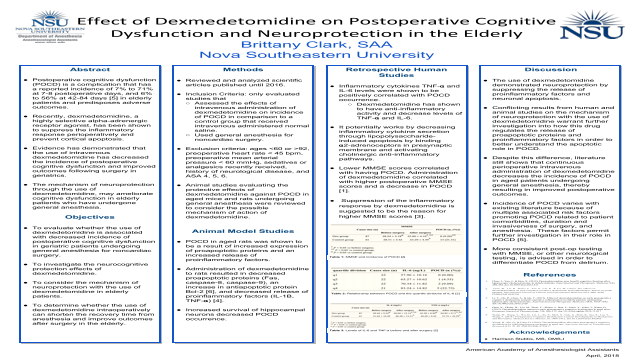 The mechanism of neuroprotection through the use of dexmedetomidine, may ameliorate cognitive dysfunction in elderly patients who have undergone general anesthesia.